Software-defined WAN (SD-WAN) allows enterprises to use a variety of transport links (including Internet, MPLS, wireless and broadband) and to deploy branch sites in a cost-effective and agile manner. A key value proposition of SD-WAN is the centralized, software-based control and policy management that shifts IT Ops’ focus from network management to that of application management. In turn, it provides enterprises with much needed control mechanism to deploy, run and manage WANs that helps improve operational efficiency and reduce total cost of ownership. This has attracted strong interest from enterprises, especially verticals with highly distributed branch locations (e.g., retail, healthcare, banking and financial services, and education). But how do you know your software-defined WAN is working as expected? Can you confirm you are making the right policy decisions? Can you identify performance hot spots? Confirm that your critical applications are taking the expected path and troubleshoot them when they aren’t? How do you know when you are nearing your capacity limits without exceeding them? It’s Riverbed’s assertion that the ability to monitor and troubleshoot your software-defined WAN is essential for successful deployment and operation. 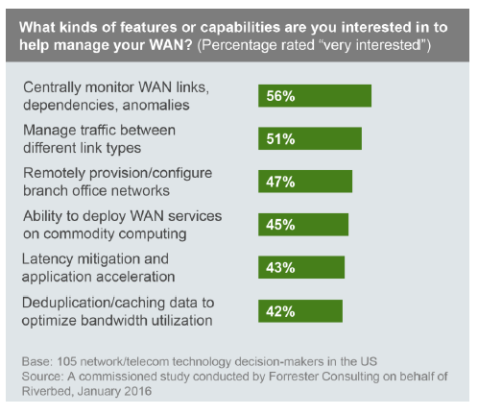 A recent study by Forester Consulting agrees; the capability most desired by respondents (56%) to help manage the WAN is the ability to ‘centrally monitor WAN links, dependencies and anomalies’ (See Figure 1). 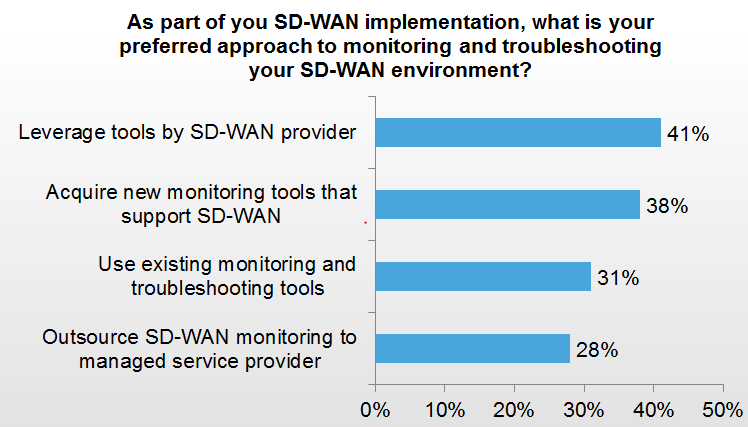 EMA asked SD-WAN users about their preferred approach to monitoring and troubleshooting their SD-WAN environment in its August 2016 Next-Generation Wide-Area Networking report. Interestingly, 100% of respondents were using an SD-WAN visibility solution. The preferred approach by a slight margin (41%) is to leverage the visibility tools offered by their SD-WAN provider (Figure 2). From the start, Riverbed recognized the need for visibility into SD-WAN environments and planned to integrate Riverbed SteelCentral performance management capabilities into its SteelConnect SD-WAN solution. The ability to validate that policies are working as expected, to troubleshoot performance problems quickly, and to plan for changes can help ensure the success of your SD-WAN environment. 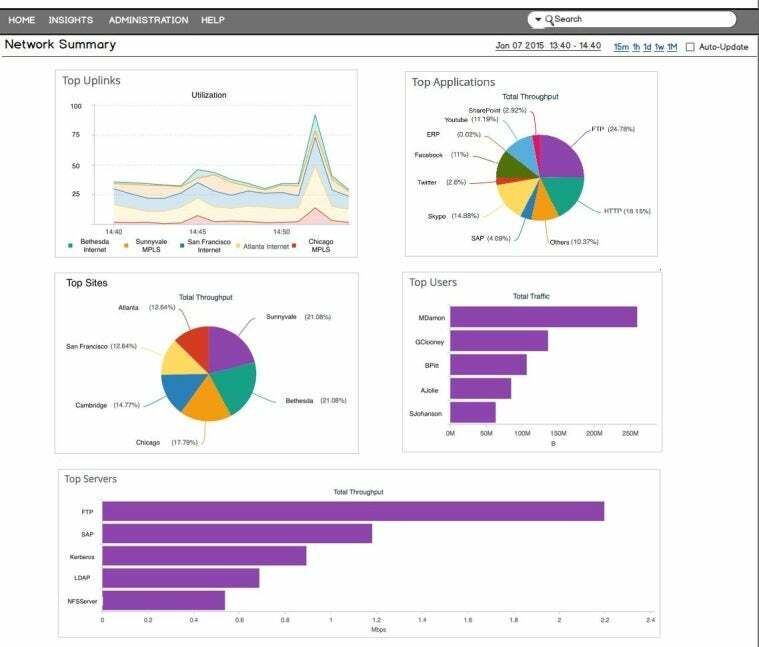 SteelCentral receives SteelFlow, a Riverbed-specific form of NetFlow, and REST from SteelConnect Manager and uses this data to provide visibility into usage and availability about your organization’s overall SD-WAN network, specific sites, servers, applications, and users (See Figure 3). What’s happening on my SD-WAN? What was the behavior yesterday, last week or last month? Which uplinks are handling the most traffic? How is traffic flowing between sites? Are there any performance problems? What is affected? What’s happening at a particular site? How is the traffic flowing out of the site? Is it in line with the policies? What is the quality of the path used? Which applications are used most often? Who is using them and what devices are they using? Even though SteelCentral visibility is an integral part of SteelConnect, I hope I’ve convinced you of the many ways that performance monitoring is essential to deploying and operating a successful SD-WAN environment. SteelCentral NetProfiler for SteelConnect provides essential visibility to validate policies are working as expected, to troubleshoot problems quickly, and plan for changes. If you would like to test drive Riverbed’s SD-WAN solution, click here. Alternatively, if you would like to chat with someone at Riverbed regarding the migration path to SD-WAN or generally need information about the Riverbed solution, please get in touch here.